Another shot for the Scavenger Hunt competition. The title is basically the category. I saw this coming out of the wellness center today and thought it really captured the essence of the category name. Wonderful high contrast image, Ann--very effective with all the lines and angles. Well spotted and it does fit the category perfectly. Great shot, I really like your processing too. Love all the geometry here, perfect for the challenge! Very dramatic and perfect for the category. Oh, well spotted and wonderfully captured. Nice spot and capture! Looks great as a b/w! FAV! Love the light and shade and the lines. 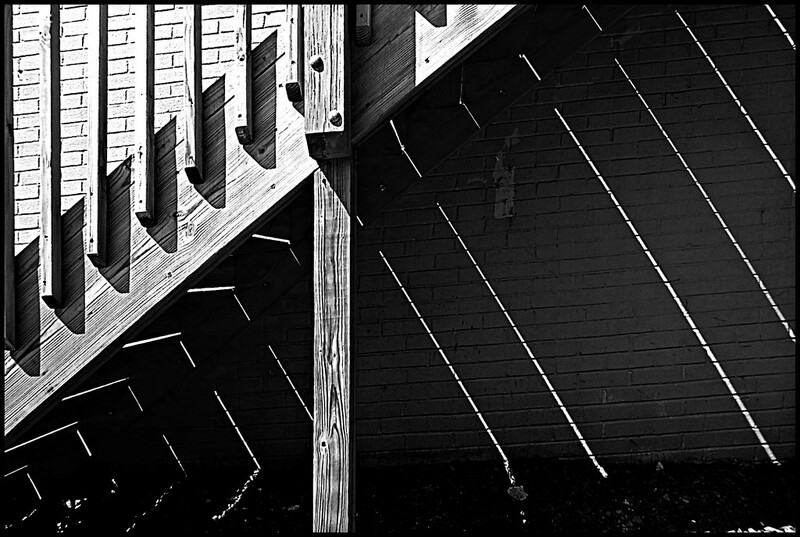 Lots of lines, light and shadow. Beautiful lines and dark and ligth compares. Very nicely seen, framed, taken and titled. Wow love the lines and the light and dark! Many thanks to each and every one of you! My apologies for the mass thank you- I hyper-extended my left shoulder today and it hurts!! Thanks for putting this on both the TP and PP and a special thanks for all the favs!! Perfect photo for the scavenger hunt. Fantastic lines, shadows, textures and more. Well done!!! Neat shot of those small little light of lines!! I like this one! You have a good eye for B&W..
Not sure what happened; I thought I was following you, but then it seems I wasn't! I think there's an echo in here! I've found a few folks that I was following were un-followed (not by me) for some reason. I think it happens when they do a little house-keeping on here.